The Western Flyers are one of the most exciting bands to glide on to the music scene in years! 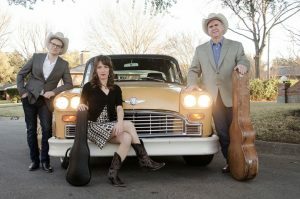 Their unique sound is a cross section of the Great American Songbook: classic western swing, hot jazz & swing standards, vintage country & cowboy songs, and electrifying old-time fiddle tunes. Dubbed “The Biggest Little Band in the Land”, the trio features archtop guitar-slinger Joey McKenzie, who brings his dynamic rhythm guitar style and smooth vocals to the band, along with Katie Glassman, 3-time National Swing Fiddle Champion and vintage-style singer extraordinaire, plus legendary double bass-player, Cary Black.